Yes perhaps that was the case. As said in this instance I am not too worried, I'm going to attempt to 'mask' it with some weathering . 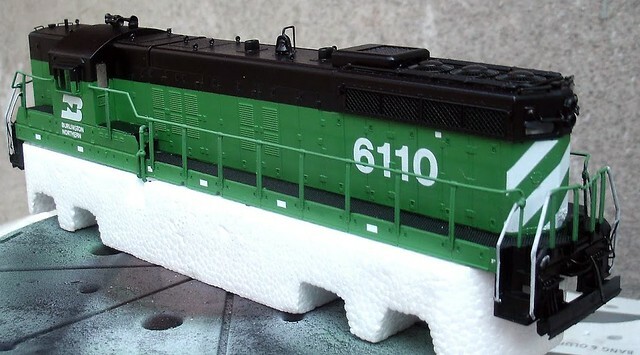 I will have plenty of practice as I have at least 3 locomotives that I want to (re)paint remaining. Looking forward to see the progress on your BN SD9, are you planning on getting it ready for the 10th at Broadclyst, or will we see the Conrail loco there ? torikoos wrote: Yes perhaps that was the case. As said in this instance I am not too worried, I'm going to attempt to 'mask' it with some weathering . 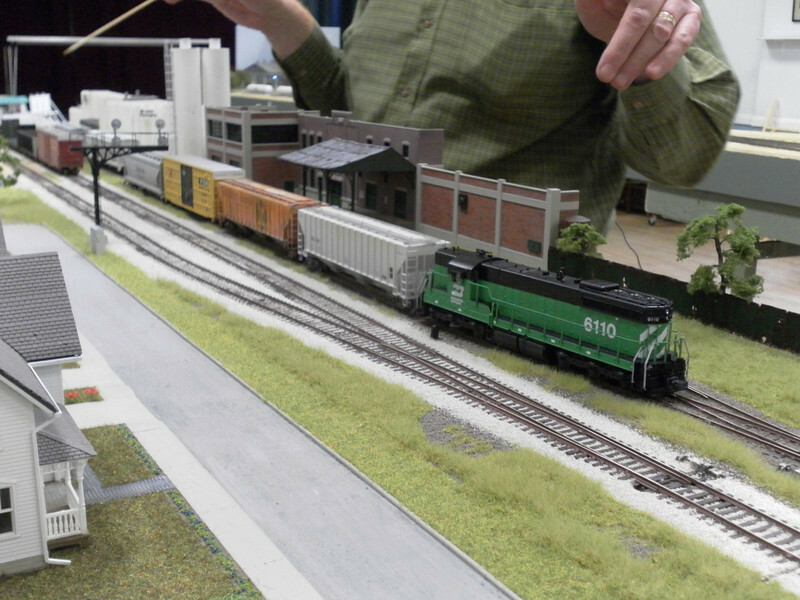 I will have plenty of practice as I have at least 3 locomotives that I want to (re)paint remaining. Umm... No, it won't be at Broadclyst - too much to do on it, decal-wise, and then to put a decoder into it. Especially since I can't find the Microscale BN set that I was given - the usual "put it somewhere safe" routine. The Conrail SD9, UP SD7 and SP RS11 will be tootling along, 'tho, for some choice on the day. Looking forward to it Brian. Should promise to be a fun day, and I'll volunteer to be a crew member on one of the trains. I should be able to be there for most of the day. Last night I found the Microscale set; it was for a BN GP35, but it does the biz. Next up, the number boards, and put back the doors and ladders (one short for the prototype, but that can be remedied later). Then, some thin clear plastic to be cut to represent the open cab windows either side. Some pretty impressive progress, you sure it won't be done by the weekend? That is indeed progress if I ever saw some, impressive Brian! torikoos wrote: That is indeed progress if I ever saw some, impressive Brian! It's all been done in about six or seven hours, from starting to strip the paint off to where it is now. It's just doing an hour or two each night, instead of watching the ghastly gogglebox (which I rarely if ever do, these days). No excuse, Koos!! 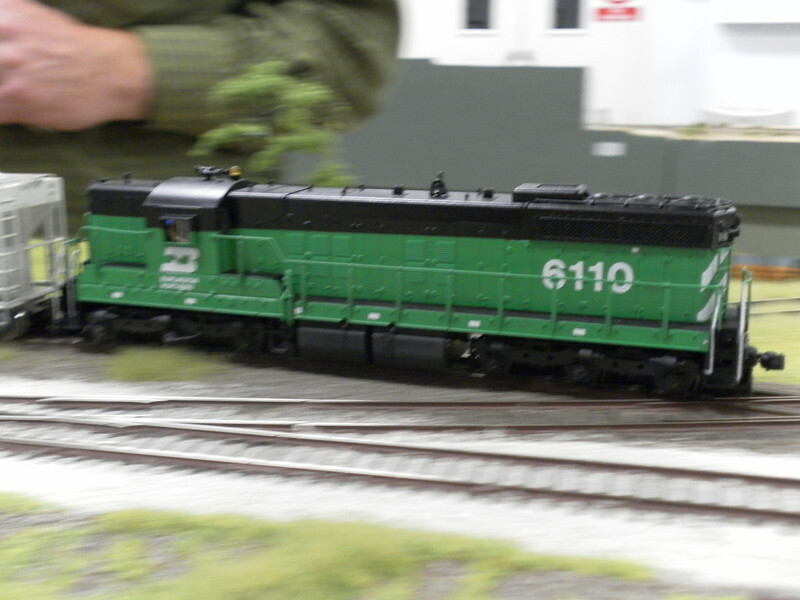 Managed to complete the decalling on the number boards, and it's now on the Conrail SD9 chassis (which has a Loksound decoder already attached). So, a shiny BN long-hood-forward BN SD9 to play with at tomorrow's modular meet at Broadclyst. Excellent - that photographer is either taking detail shots or must have a very wide angle lens though. Gloriousnse wrote: Excellent - that photographer is either taking detail shots or must have a very wide angle lens though. Fuel tank detail - he's a confirmed SD9 man.